Moral of the story:- Make sure the neighbour’s son stays a bachelor till you are “settled”! Then again, I guess you know of *some* people on the other side of the fence, who insist that they want to get married, claim that they have enough to feed a joint family (if not a community) and that they are the only non-son-in-laws in their groups, but to no avail. I so empathise with this one. My deadline is 2011 too. And that’s an extreme deadline. 2011, huh? Sounds great! Your knight shining an armor awaits you somewhere… 🙂 Guys get that kind of deadline too, you know! Dada, ha ha ha ha! Thanks bhai! Great news about your neighbor, though. So when are YOU getting married 😛 ? Ha ha ha! Actually it’s not that I am in this situation right now – but you never know – it could crop up some day! 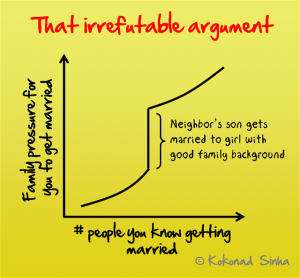 This post was inspired by observing friends getting married, actually! The timing of this post is ‘perfect’ for me. I am at home these days. My younger brother got married 2 days back. And i m struggling to get back to work with a ‘single’ status. Will write a post about it. I ensure that I put weight every time I see my mom. That rules out the ‘No one to feed you’ argument. so how many sites are you on? Shaadi, Match.com, matrimony.com 😀 Hilarious isn’t it!!! LOL! Me not on any shaadi site! 😛 At least as far as I know (meanwhile I am opening a new window to search for existing matrimonial profiles someone might have created as a joke *shiver me timbers*). @Shiv: Revathi’s got a point. I want you to top that reply! Or will you cave? 😛 and that someone may just be your parent…and expect the pic to be as photoshopped as photoshop can!!! @Revathi, Well, that is why, I ensure that I got addicted to Ghee and Sweets. And consistently, gain a pound or two whenever you go home (which is quite easy). Basically, portray that you are a foodie who just gains weight. Irrespective of home or away. @Koke, I am waiting for the graph! 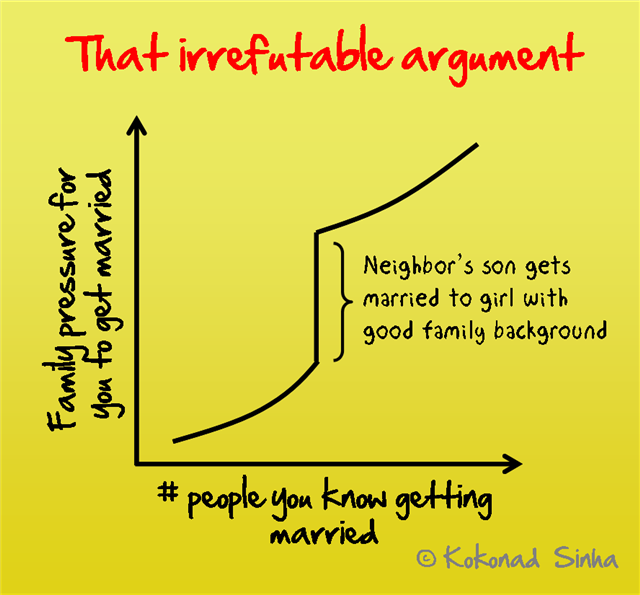 Another graph would be indicating the proximity to nervous breakdown as you ARE introduced to your better half’s parents! hmmm im all curious now …waiting for the cartoon koke. @ shiv…arent u going home day after…lol….all the best ! Cartoon aayega, aayega. 🙂 Next cartoon in line is probably going to be a post on political correctness. Uske baad we will revisit the marriage thing! LOL! This is soo true. I’ve seen it with many of my friends too. So was my case but my hubby decided for himself when he wanted to marry. His parents left him the choice and dint force him. Welcome to my blog Shweta! Thank you for the compliments – I am glad you liked the graph! The Universal, rather Indian truth. Welcome to my blog! And thanks for commenting. 🙂 It makes me happy that several people are connecting to it! Talk about more things change, the more the stay the same! My mom and dad got married the same exact fashion nearly 40 years ago. And yes, Dad tried his best to feign complete ignorance of anything called “marriage” until his mother sent him weepie letters i.e. Emails of that Era. Ha ha ha! My dad did the exact same thing too! He showed that he was least bothered that he was getting married 😀 And we ALL know that wasn’t really the case inside his head! Heh heh! Man, that graph really is on great demand! 🙂 Aayega aayega, uska number aayega! i’ve been ducking my head out of the way of marriage proposals… glad to know i m not the only one…. ! Ashwathy´s latest blog post – Three more 55-ers! Thank you, thank you! People have been asking me the question if I am in the current state now, you know? Heh heh… I am glad my parents have left it upon me to decide when to marry. But who to marry – that’s a completely different saga altogether!